Map avalanche is rolling on - Locus Map 3.20 is here!Locus	Map avalanche is rolling on - Locus Map 3.20 is here! It’s not so long ago when we informed here about the release of 3.19 version, full of changes, fixes, and above all, new maps of U.S. Nevertheless, we had something left in a drawer so we decided to release another version right after two weeks. 3.20, again, is mainly about new maps, this time of Europe and Middle East. 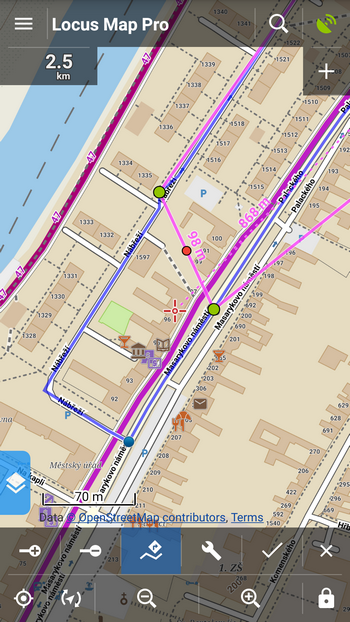 The maps excel in clean and clear drawing and are zoomable in several levels. They display marked hiking paths, cycling routes and symbols of tourist facilities and attractions. 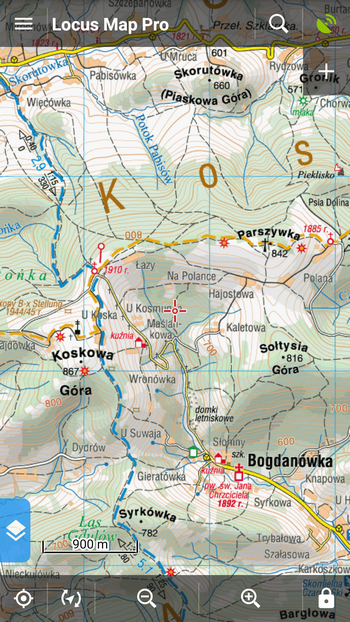 Kompass maps are available in the form of offline packages, containing particular map area, furthermore, it’s possible to define your own custom map crop and zooms. Maps are drawn in one scale, basically 1:50 000, and other zooms are, therefore, rendered as its augmentations, respectively diminutions. Anyway, the maps are structured very nicely and in great detail. They contain network of marked hiking and cycling routes, horse-riding routes and sailing routes on the big lakes of the North. Of course, complete tourist facilities and natural and architectural attractions list is included. 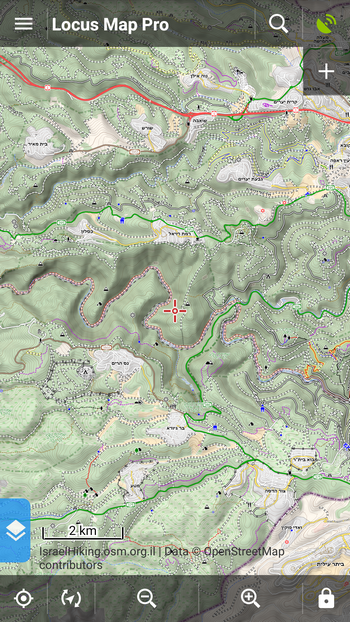 The map is available in Locus Store in three versions – hiking, MTB and hiking trails network without background that can be displayed above any other map of the area through the Map overlay function. 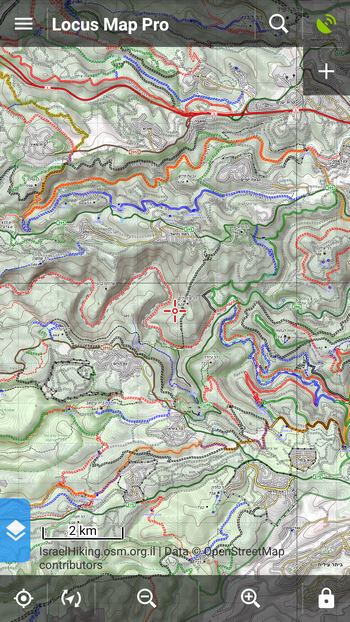 All maps can be downloaded to offline for free. Finally, routepoints/viapoints distinguished when drawing a route! 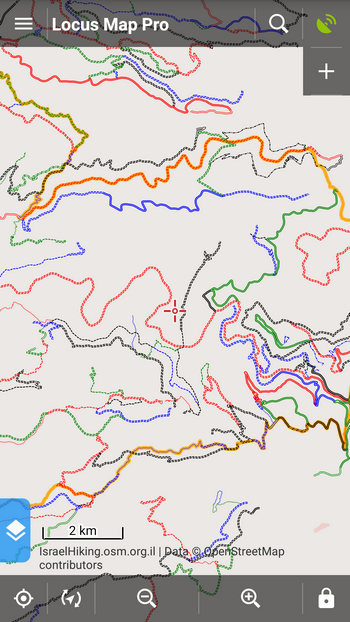 a normal manually inserted route point that is depicted as a green dot on the line during the drawing is left WITHOUT any highlighting when the route is saved. Such a route point tells Locus just to “draw the line this way” and it doesn’t matter if you draw the route with or without router’s assistance. 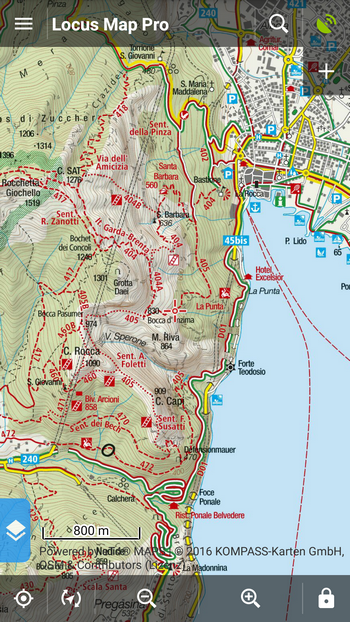 Navigation along the route announces in this case only direction changes and distances (e.g. “after 200 meters turn right”) and when recalculating the route with the point priority the route is directed right to the final point. 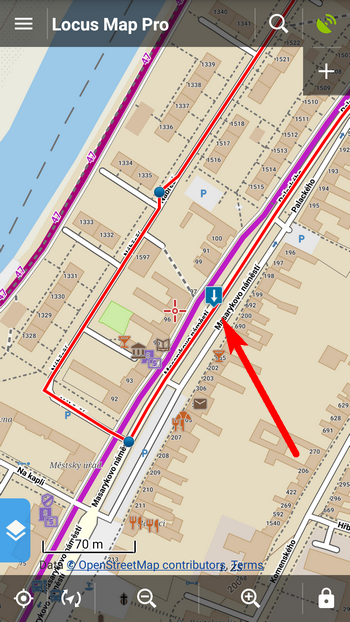 if you want to insert a point with some additional information to the route, like “good pub” or “my buddy’s cabin”, and want Locus to navigate you through this place (viapoint) even when the route is recalculated, add it with the + button and then tap it with your finger again – the green dot turns BLUE and the point is ready for further editing. 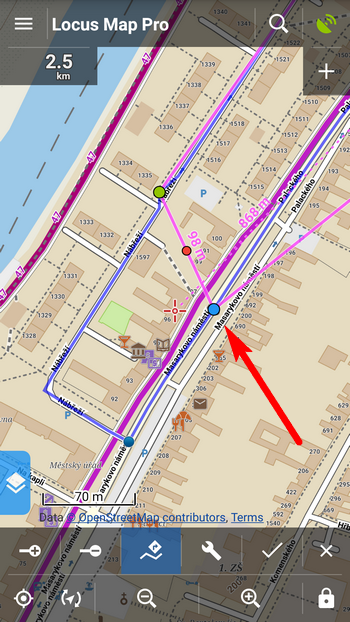 Save the route, icons with arrow show above the “blue” points. 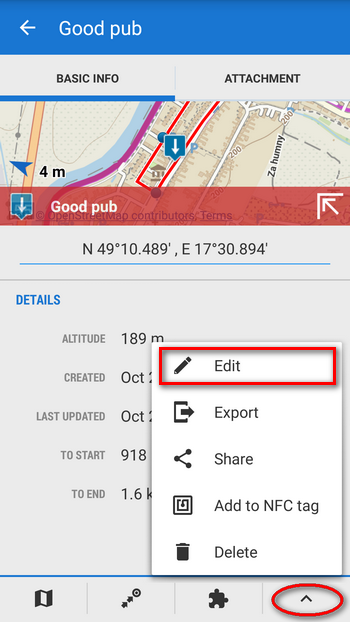 Tap to select the point, choose “edit” and you can change its name. If you have TTS (text-to-speech) set in your voice navigation, the voice notifies you of such a point (e.g. 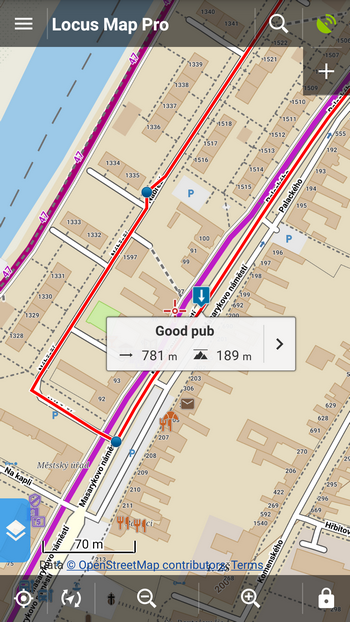 “after 200 meters good pub”). Of course, other navigation commands remain the same. As you know, that’s not all – other changes and improvements are listed in the changelog that can be viewed from the main menu > about app. Ich habe einen track und rufe die informationen zu fiesem track ab. Eine info zeigt die zeit fur einenzurückgelegten km. Die einhei müsste min/km sein.falschlich wird aber km/min verwendet. Sorry, we can’t simulate your problem – the unit of pace is min/km. Die Kompass Karten sind ja sicher schön. Aber die Preise sind ja absurd, genauso teuer wie die Papierkarten. Und das für Karten die nie wirklich aktuell sind, die nicht grade ins Detail gehen, zumindest nicht so wie es Vectorkarten meistens tun. Da fehlt jedes Verhältnis zur Realität. Aber trotzdem schön, dass ihr das integriert habt, für Leute denen das egal ist. the price is as it is – that’s Kompass’ price policy which we can’t do anything with. And yes, some people don’t care about the price, they are used to these maps.